Suddenly rumors are swirling, and Holly's face is captured on countless phones and plastered all over the Internet. But the band can't risk a scandal destroying their family-friendly image, so Dominic convinces Holly to be his fake girlfriend--just for two weeks. How bad could it be to be fauxmantically involved with one of the cutest rockstars on the planet? Holly's about to find out. . . I love Marni Bates. I love that she writes stories that I absolutely want to read. When I read her first book, I was blown away with how much I absolutely adored the story- she is hilarious! Decked with Holly continues that trend. There are many scenes in the book that are literally laugh out loud funny. Boy bands and heart throbs are something that any generation or age can appreciate and this story transcends even the YA genre. Don't get me wrong, this is a teen book. But the way the author writes is so relatable, so friendly that any age can appreciate and enjoy her writings. I really can only guess that it is a matter of time until one of these books or even one of her future books becomes a movie or a television show. There is just so much funny and fabulous material in her books! 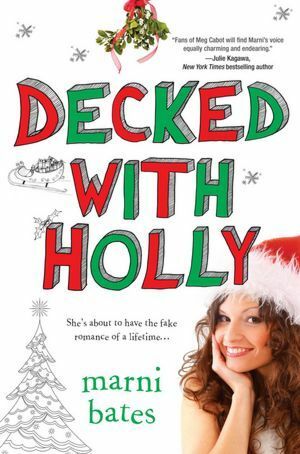 Decked with Holly is about a girl who is forced to spend the holidays with her family. The setup for this book is comical and almost like a sitcom. She is granddaughter to a rich grandfather who is also her caretaker after her parents die. Her grandfather decides that even though he is loaded, she needs to learn the value of a dollar and is unable to live like her family does. The rest of her family (aunts, uncles, cousins) are stuck up and incredibly rude to Holly. The set up for this vacation seems like torture! This is a light fluffy book that I am so glad I read. It is a book that will cheer you up and lift your spirits. I highly recommend this book and any book this author writes! This sounds like a funny read. I could use a light read right now. Thanks for sharing.